NEWS RELEASE: Mobile film contest provides West Michigan students with a platform to tell their unique stories. 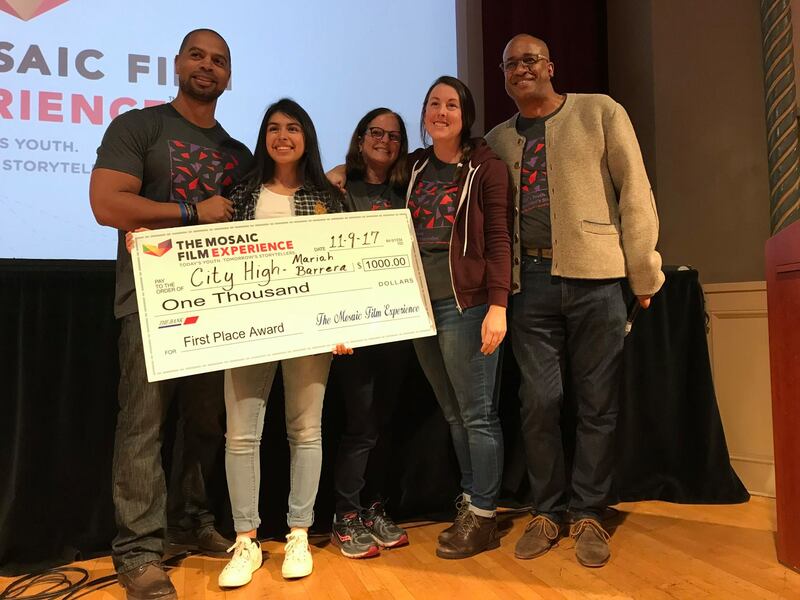 GRAND RAPIDS, Mich. – September 25, 2018 – The Mosaic Film Experience (MFE) today announced the kick-off to its fourth annual Mosaic Mobile film contest, a short-film competition for West Michigan high school and college students. All Mosaic Mobile films are shot, edited, and entered on mobile devices. Entries can be submitted via the MFE website until October 12 at 11:59 p.m. EST. New for Mosaic Mobile 2018, MFE is teaming with ArtPrize to host the first-ever Mosaic Film Experience: The ArtPrize Film Challenge. As part of ArtPrize Education Days, more than 100 Grand Rapids high school students from four schools will meet at the ArtPrize Theater on Friday, September 28 from 9:30 a.m. to 1:30 p.m. The event will feature an MFE-taught mobile film workshop and time for students to explore ArtPrize to shoot their films. Films will be completed over the weekend and submitted by 1:30 p.m. on Monday, October 1. Completed films may be eligible for submission to the 2018 Mosaic Mobile competition and will have a chance to be highlighted on ArtPrize’s social media channels or premiered at a special screening at 2:30 p.m. on Saturday, October 6 at Rosa Parks Circle. All Mosaic Mobile films must be two to three minutes in length and must meet three requirements. Entrants must use “tell a story” as a theme for their film, include some form of art as a prop, and the words “it’s different now,” must be spoken or used in the film. Art used in the film must be self-produced or shown with permission of the artist and credited. A juried panel of experts will award first, second, and third place cash prizes in high school and college categories. First place winners will each take home $1,000, second place winners will receive $500, and third place winners will each win $250. In addition to the juried cash prizes, a public vote will determine the high school and college Rick Wilson Student Choice Awards. On October 24, MFE will announce the top 10 high school and college films, as determined by the juried panel. The films will be posted to the MFE YouTube channel. Public voting will open at noon on October 26 and close at noon on October 29. The high school and college Rick Wilson Student Choice Award winners will each receive a $500 cash prize and video production gear. Mosaic Mobile high school contest winners will be announced at the seventh-annual MFE Event on November 7 and 8 at the Wealthy Theatre. Students can enter up to two entries each. Complete rules and contest requirements are available on the MFE website: http://mosaicfilmexperience.com/mosaic-mobile/. http://mosaicfilmexperience.com/wp-content/uploads/2018/09/Mosaic-Mobile-2017-Winner-Mariah-Barrera.jpg 1536 2048 Adam Russo http://mosaicfilmexperience.com/wp-content/uploads/2017/06/MFE_Logo_TM_with_Tagline_TM.png Adam Russo2018-09-25 11:53:332018-11-30 16:58:45NEWS RELEASE: Mobile film contest provides West Michigan students with a platform to tell their unique stories.